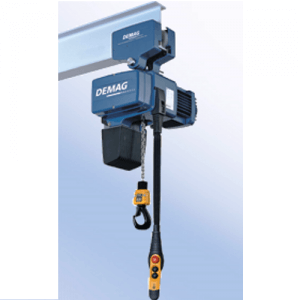 The Demag DC Pro hoist is both compact and versatile with lots of features included as standard, not as optional extras like other branded hoists. The Demag DC Pro hoist boasts ‘all inclusive’ features. This means there are no hidden costs for those extra add-ons you frequently see. 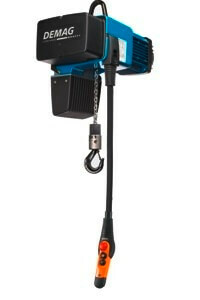 With a long service life, excellent reliability and optimum ergonomics the DC Pro is a great electric chain hoist. It is easy to install, use and service which is a big benefit for most businesses. what’s more, the main components are maintenance free for up to around 10 years. 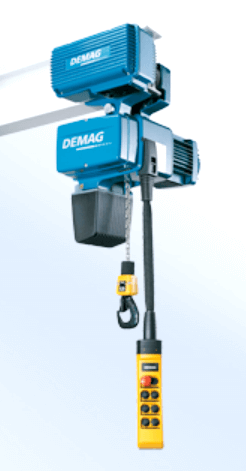 Incorporating two lifting speeds as a standard feature the DC Pro is a versatile electric chain hoist. It comes in a choice of finely graded lifting capacities up to 5000kg. It incorporates aluminium housing components with a powder coated finish, and is suitable for tandem operations. 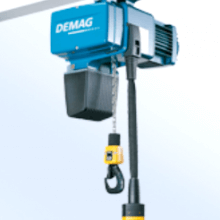 This electric hoist has a superior, regenerative braking system for its low-wear brakes. Braking adjustments are not needed. 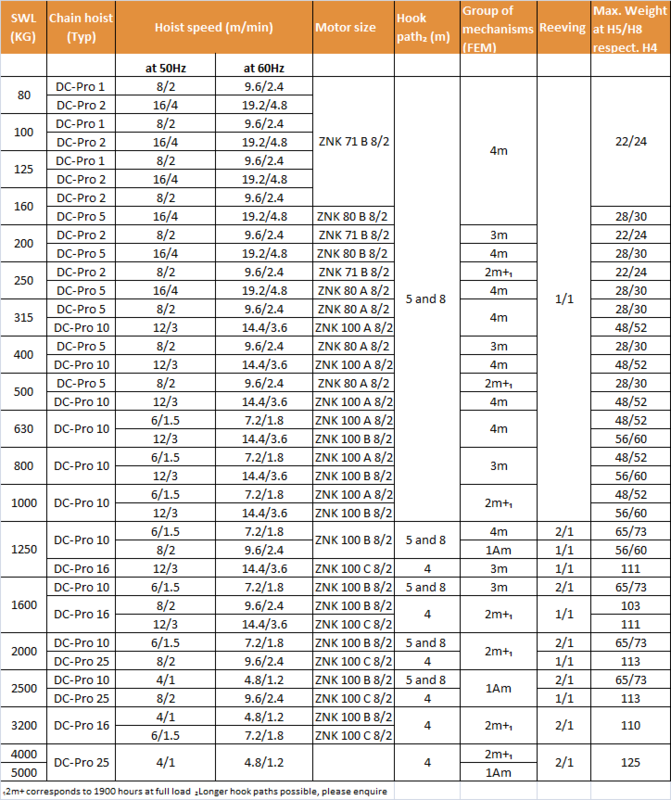 It is a separate DC brake with no bonding due to it being double encapsulated. If the power fails the brakes are applied automatically. The incorporation of a service cover enables easy access to connections, collector for control cable, chain drive and strain relief management. The duty factor for the DC Pro is 60% (40/20) giving 360 starts per hour. There are also signals for applications with three motion axes. The contactor control is 24v and has an internal tri-state signal transfer. The electrical connections are all plug & lift/drive for ease of use. The pendant type controller is height adjustable to allow the control pendant to be positioned to suit your specific requirements according to the lifting operation. It also boasts low fatigue actuation force. The incorporation of an elapsed operating time counter, status and error messages means that information is readily available and is easy to read on the display. IDAPSY software to manage data is available. 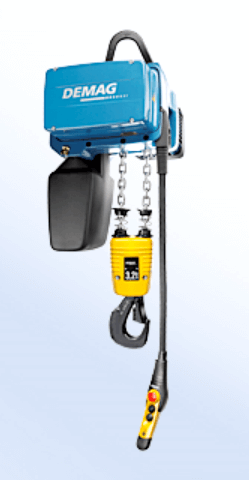 This hoist boasts reduced wear chain due to the 1/1 reeving for loads up to 1000kg. The chain can be easily replaced without the need for any dismantling. It can also be lubricated through the special lubrication opening in the chain guide. The two pivoting suspension brackets not only improve the ‘C’ dimension (for DC1-10) but also enable the hoist to be easily fitted to an already fitted trolley. 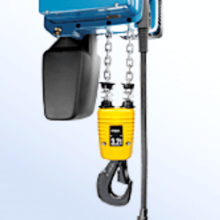 This hoist meets all the standard safety requirements so you can be reassured of safe operation when using the hoist correctly as specified. 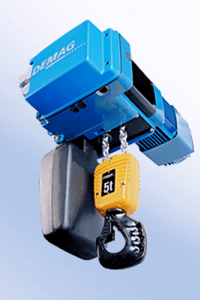 The 24 volt contactor improves the safety of the Demag DC Pro. The upper and lower limit switches and elapsed operating time counter helps with safety too. The slip clutch acts as the overload safety device, this is located in front of the brake within the load bearing arrangement. The slip clutch ensures there is no continuous slipping thanks to the automatic cut out. It also ensures that the load will be held securely at all times and together with the automatic braking system the load will hold firm even in the event of a power failure.